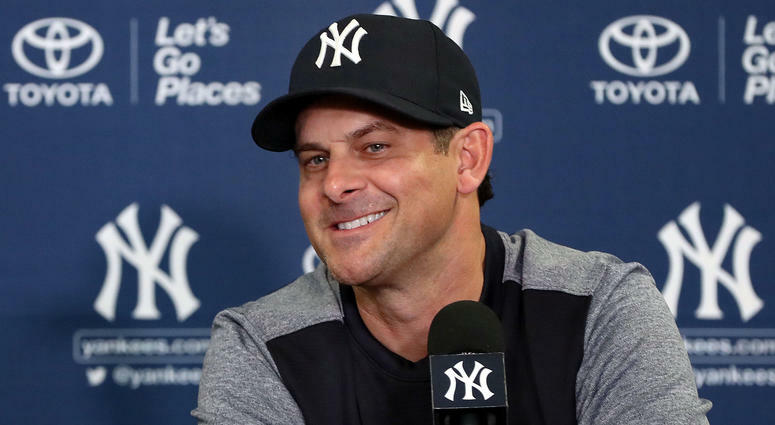 Yankees Manager Aaron Boone addressed the media ahead of Friday night's Game 1 in Boston with the Red Sox. Boone said he expected the atmosphere in Boston to be "Buzzy. I'm sure it will be awesome. You know, the cool-down today, fall in the air, two great teams, two great franchises, two great fan bases, it should make for a special environment. I'm looking forward to it." Q. Is it one of those things where you're looking to get one of two? Is it tough to say that to your players because you're looking to win every game? Do you take it one game at a time? Walk us through that mentality. It's difficult coming here on the road. AARON BOONE: We don't look at it like that. We look at it go play our game. Go play well. You know, it starts with first pitch. Win a pitch. Offensively have quality at-bats. Control the strike zone. You know, play catch on defense. J.A. go out and pound the strike zone. Those are the things that we can control to some degree, and that's the focus. And if we do that well, we'll put ourselves in a good position, not only this game, but in the series. AARON BOONE: That happens by controlling the strike zone, especially when you're up against good pitching where that's very difficult to do. And it's very difficult to hit the ball out of the ballpark. I don't think you go up there trying to hit the ball out of the ballpark. We just have hitters that have power and that's part of their game. But it starts by controlling the zone. And if we do that as a group consistently, then usually you give yourself a chance when a pitcher does make a mistake. And if you're doing that up and down the lineup, over time you'll net yourself more mistakes. And those are the ones you have to take advantage of, especially in the postseason when you're up against elite pitching. AARON BOONE: I think there's a little benefit to that. Certainly when you start out in the season you want to win the division and have the ability to set things up exactly how you want, rest guys if you need to. But I think there's a lot to be said for, we've been playing meaningful games all the way till the final Sunday of the season. And had to win games against some good clubs down the stretch to kind of secure our position, to secure that home-field advantage for the Wild Card. So hopefully that's a sharpness that comes with that. I think there is. And I feel like our club is as healthy and as whole as we've been throughout the year. I feel like we finished the season playing well, and we're able to carry it into the first game of the postseason. Q. Aaron, in the Wild Card game you were pretty aggressive defensing Andujar and bringing in Hechavarria. Do you feel that's something you're going to do again here? AARON BOONE: That's something that's game to game fluid, I would call it. The Wild Card game is a little bit different in that I think we had ten pitchers and a deeper bench. So you had a little more flexibility to make some moves earlier in the game. I envision us using our roster. But it will be kind of a game by game, inning by inning kind of strategy or how we'll deploy our guys. But it's a little bit different now that we're in a series and with the way our roster is constructed now. AARON BOONE: Well, I talk about controlling the strike zone, and he's as good as there is at that. He's come over here and immediately fit in with our group. I've pretty much inserted him at the top of the lineup. His ability to get on base, to take close pitches, he's also hit for some power from that spot. We've asked him to play different spots in the outfield when he first got here and Aaron was injured. He was playing mostly right field. Then we switched him over to left field, where he hasn't played since the minor leagues. He's been willing to do any and all of that, "whatever you need", kind of, and he's done it well. But I think going along with us as an offense and controlling the strike zone, he kind of sets the tone for that at the top. And he's been an impact player for us. AARON BOONE: Yeah, so I was actually broadcasting I think his Major League debut last year in St. Louis. So I do remember him just because he's a little unforgettable when you first see him, with the buttons buttoned down. First thing I thought of was Dante Bichette. He reminded me of that. I think I might have said it in the broadcast. I've said this but I give our front office and our analysts a lot of credit for identifying him as somebody that they felt was undervalued and potentially really good hitter at the big-league level, and he's been that for us. He's come over here, and I talk about Cutch having an impact and being an impact player, that's what Luke has been for us. Another guy that does a really good job with the strike zone and the power he has. The power he has the other way, which really obviously plays well in our ballpark. He's just been -- he's been really consistent for us, a consistent producer since he got some opportunities to get in the lineup and he hasn't turned back. He just kind of kicked the door in and took it.